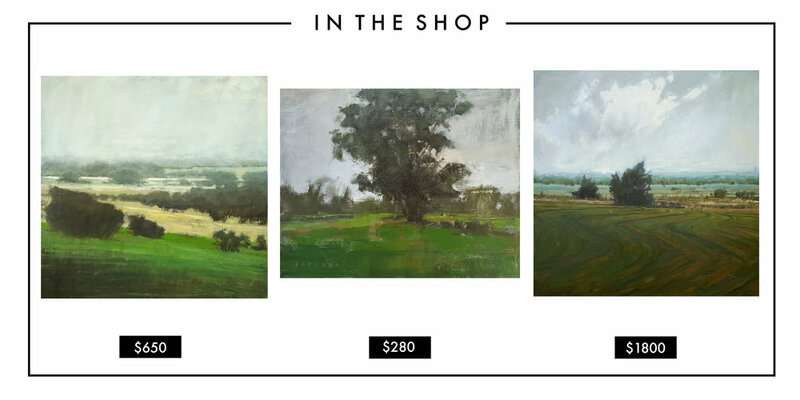 ABOUT: Erin paints landscapes and seascapes from all around the country. Her oil paintings are loose and expressive, and she has a great talent for capturing the ever changing light and depth within expansive natural spaces. ABOUT: Marina uses watercolor and resin to create her horizon and botanical paintings. They are a mix of transparent and opaque layers that create natural subject matter with unnatural colors. Her work is spontaneous in nature and inspired by movement and the way colors interact with one another. ABOUT: Gina creates abstract and figurative paintings as well as illustrations. Her op art paintings use a bold, often limited, color palette with many values of the same color. In her words, they express her "love of precision and exactness." The Op Art movement began in the 1960's, and these pieces pair perfectly with designers, like Jonathan Adler, who draw on the same era for inspiration. SAVE THE DATE: Gina has a new collection of 20 works that she is releasing November 30th at 11am CST. ABOUT: In her work, Taylor creates scenes the set tiny humans against abstracted landscapes. A swipe of the palette knife becomes a body of water; Geometric shapes become mountains. Their combinations are so playful and imaginative. SAVE THE DATE: Taylor has small works on paper & 100% Acrylic & Resin ornaments releasing in her online shop November 25th! ABOUT: Everything about Hillary's artwork from the color combinations to the titles exudes fun. 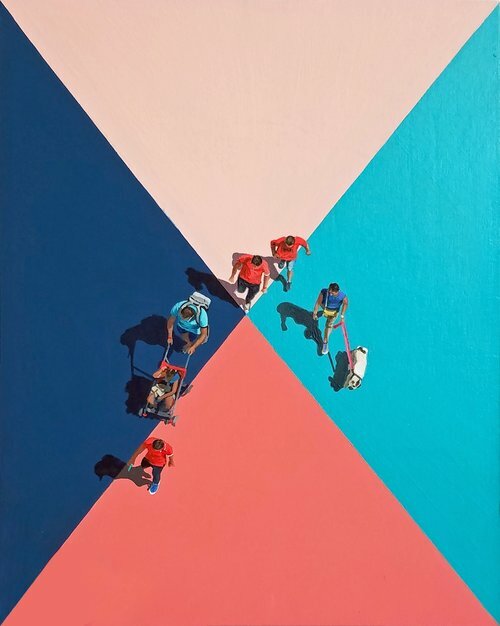 Her work is abstract, focusing on bright color combinations and the kind of brushstrokes that make you feel like you can imagine the artist painting the work right in front of you. SAVE THE DATE: December 3-4 Hillary with be having a shop the 'gram party where you can purchase smaller art on Instagram. MEMPHIS LOCALS- Don't miss her pop up shop at Blu D'or Interiors in Laurelwood on December 16th rom 10-1PM. 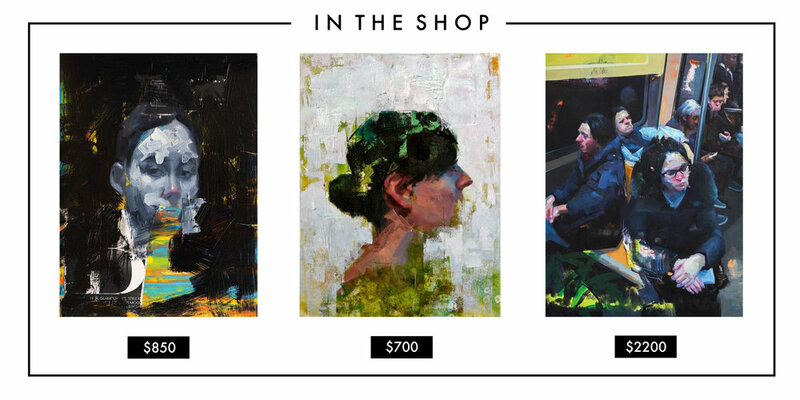 ABOUT: John Wentz creates layered mix-media portraits and figurative works using oil paint and sometimes collage. A catalogue of his work can be found on his personal website, and his paintings can be purchased through his gallery, Hashimoto Contemporary. ABOUT: Whitney's paintings are created with watercolor and ink. Her combinations of abstract, organic shapes of color move across the page with fluidity, and they remind me of large scale reproductions of what you might see on a slide under a microscope. Shop her prints and hand-painted coasters on her website, and find her original artwork at Bella Vita in Memphis. SAVE THE DATE: Look out for her "Shop Small Saturday" code to receive 30% off her website. ABOUT: Rylie's paintings are an expression of a love of color and structure. Her mixture of wild brushstrokes creates a sense of rhythmic chaos tempered by calming and harmonious color combinations. SAVE THE DATE: Riley will release her new SABLE SERIES on 11/24 & you can use code BLACKFRIDAY to get free shipping on Riley's work. She is also accepting home rendering requests until December 7th.